Before we proceed to the recipe, I have found it necessary to clarify what I’m actually calling “pumpkin”. Apparently, pumpkin by any other name does taste the same, but I’ve also found out that what is referred to as “pumpkin” in different parts of the world, isn’t what we Australians know as “pumpkin”. Indeed, the butternut pumpkin I’ve used, is known as “squash” or “butternut squash” in other parts of the world. However, to be sure to be sure to be sure, if whatever you call it comes in a tin, forget it. It’s not going to kill you to make this from scratch and some supermarkets do sell pumpkin pre-peeled and sliced so you can cheat without spoiling the soup. This recipe is based on on a recipe by Margaret Fulton, who helped launch my cooking journey as a child. In 1968, she launched her first cookbook: Margaret Fulton’s Cookbook, and it revolutionized Australian cooking. Along with the Australian Women’s Weekly Cookbook, these were cooking Bibles in Australian homes and still are in many today. Our whole family loves this Pumpkin Soup and it literally evaporated off the plates . Indeed, it’s spoon licking good! 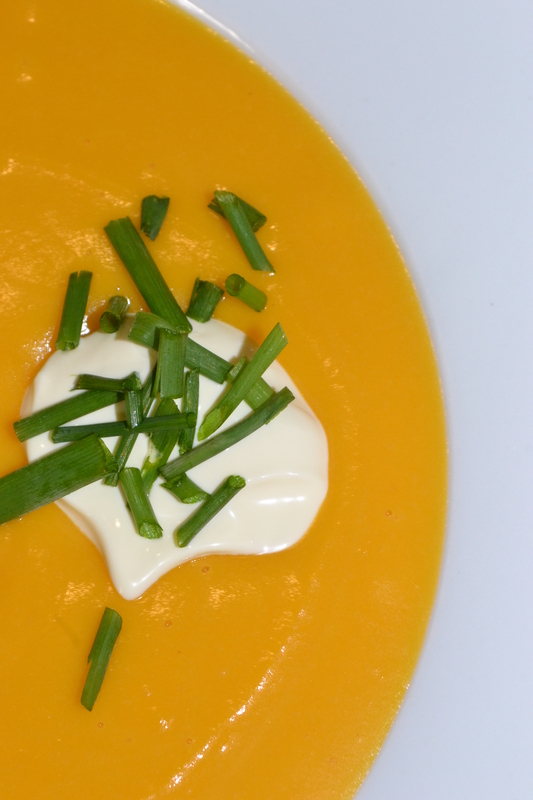 Thanks to the butternut pumpkin/squash, this soup has a deliciously sweet flavour and creamy smooth texture. Yum! In a large, heavy frying pan, melt half of the butter (45g) on high heat. Add diced pumpkin and onion, turning constantly. Fry for about 10 minutes, or until the pumpkin has started to caramelise. Reduce to medium heat and simmer until pumpkin is very tender and falling apart. Remove from heat and cool for 15 minutes. This produces a finer texture. You need to puree this pumpkin mix. I usually do it in the blender, but this is quite messy and my ancient blender struggles a bit. A friend recommended using a stick blender, which would cut out a lot of mess and encourage me to make it more often. However you blend it, the texture needs to be very fine and creamy. Melt butter in frying pan. If you have pureed the pumpkin mix in the frying pan, you will need to do this a separate, small frying pan. Add flour to the melted butter and stir together. Add a small amount of pumpkin soup to flour and melted butter and mix well, gradually adding the rest. Stir rigorously to prevent lumps from forming. Blend again if lumps develop. Simmer on low heat for 20 minutes. Just before serving, combine egg yolk with a little of the pumpkin soup and then mix that in with the rest of the soup. The dogs are my ever-faithful companions whenever I cook. Sometimes, however, they can get caught in the cross-flour. Pumpkin Soup is usually served with a dollop of sour cream and a sprinkling of chopped chives. I usually chop the chives with a pair of scissors over the top of the soup. Bread is a natural accompaniment to Pumpkin Soup. It is often served with a crusty bread roll and butter. However, yesterday I diced up a day old baguette, and fried the pieces in a mix of melted butter and olive oil in the frying pan. These were scrumptiously delicious, even if they were a little naughty. Watch the bread closely as it can burn easily. A word of encouragement. In my experience, it is hard to get this wrong. That is, as long as you don’t heed the cardinal rule of cooking. Never turn your back on a hot stove. 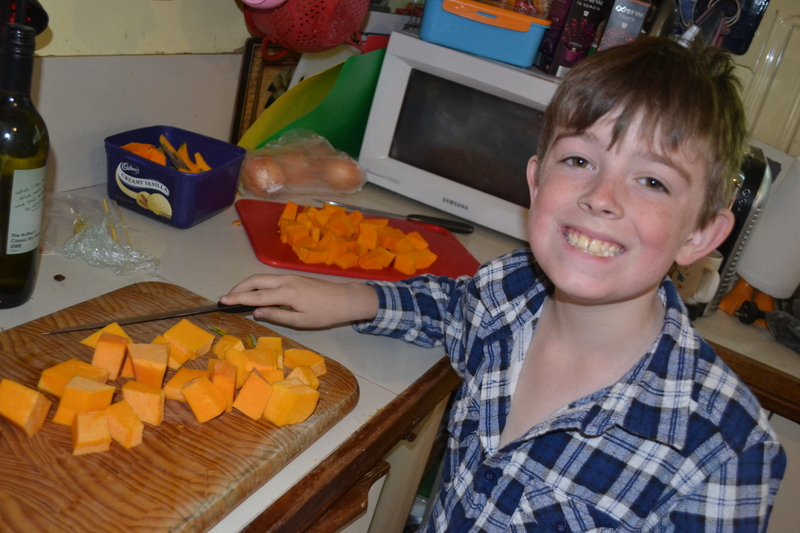 This entry was posted in Australia, cooking, Dog-Our dog Bilbo, Kids learn to Cook, Parenting, Recipes and tagged butternut squah, dinner, family, lunch, pumpkin, pumpkin soup, recipes, soup, squash on June 6, 2017 by Rowena. Weekend Coffee Share 4th June, 2017. This week, I’m offering you something a little different…pumpkin soup. Perhaps, this might’ve been healthy once upon a time. However, I’ve ramped it up tonight with a dollop of sour cream, and a sprinkling of home-made croutons. I don’t know what it is about this recipe. However, it’s the best pumpkin soup I’ve ever had. I always make it using butternut pumpkin, but it seems to have a special something. Could it be love? 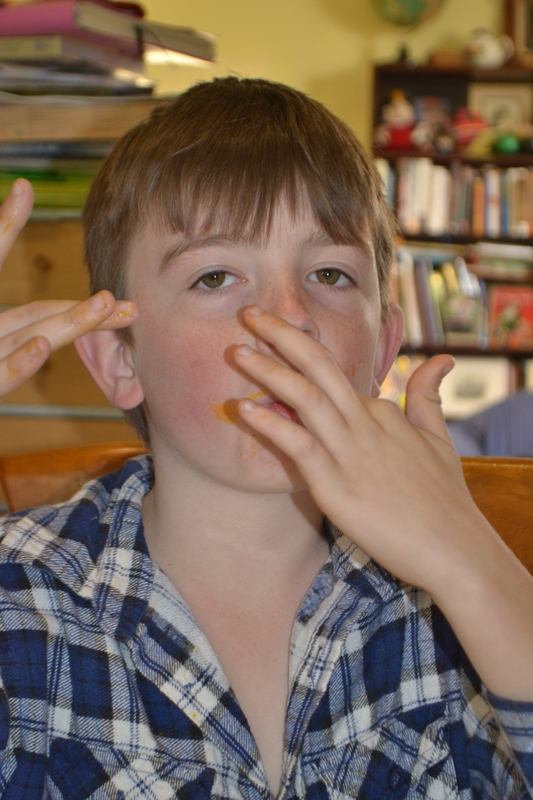 Hope you like the photo I snuck in of the kids eating their Pumpkin Soup! It’s only a few years out of date, but they looked so cute! Now, that you’d been fed, let me ask you how your week was? One of these days, I’ll have to add a rating scale. Today, is my Mum’s birthday and my Dad’s birthday is later in the week. Usually, we’d go down to their place in Sydney, but we’re so busy. Our daughter has dancing on Saturday mornings and our son has rehearsals for the Scout Gang Show. I’m hoping we might be able to get together yet. The past few weeks have been fairly stressful. I don’t know if is the sort of stress you experience when you’re stretching and growing. After all, growth is by nature uncomfortable. So much is going well, and yet my awareness of all these things I’m struggling to change, has also increased. So, while I’m now tap-dancing and doing yoga, I’m still wading through stuff trying to clear up the house. I won’t use that dreaded word “declutter”, because I don’t believe in it. Indeed, after spending hours working on my daughter’s room, I arrived home with a crate of books from the op shop. These weren’t any ordinary books either. They included a four volume set of Home Mechanics Books from around 1910. They were more about repairing things around the home such as your Grandfather clock and were absolutely fascinating. However, I am trying to follow what I’ll call a “trading policy”. That for everything that comes in, something has to go out. It works well for me in theory. However, like so many things, not so well in practice. Jeffrey Smart, Parking Lot Near Bologna 1992. This weekend, the whole issue of my teenage son’s school assignments reared its ugly head again. He’s been unwell on and off and the night before his assignment was due, our wifi went down. I don’t need to tell you that was a catastrophe of epic proportions. Anyway, not unsurprisingly, yours truly found herself researching Australian artist, Jeffery Smart, and his painting: “Parking Lot Near Bologna”. Not to do his assignment for him, but to be able to help. To be perfectly honest, this painting did nothing for me. Yet, I had to find something. Understand, at the very least, why it was considered worthy of an assignment. I personally prefer more of an expressionistic style with thick, lashings of paint, whereas this almost has a flat, photo finish. No, not my style, but I could see why the trucks might appeal to my son. That said, he’d probably prefer a Ferrari! The last part of the assignment involved writing a 100 word story about the painting. It finally clicked that this was just like the flash fiction challenges I do. So, we talked through various plot ideas and possible names for the two men (Luigi for the Italian and Sergei for the Croatian) and then moved onto people smuggling. I wanted to teach him the thinking that goes into writing something like this, particularly the structure involved. Having that twist or punchline at the end. So, I wrote an example for him. Here’s the link. It was very difficult to write, being set in Italy. However, as usual, Google came to the rescue. In between the assignment and playing Scrabble with the lad, I also read read a fantastic novel, Selling the Dream by Hugh McKay. Hugh Mackay is a social researcher and the author of 17 books, mainly in the field of social analysis. Selling the Dream is his seventh novel. I am in the throws of writing a review. However, if you enjoyed reading Graeme Simsion’s: The Rosie Project, you’ll love it. It’s hilarious and despite being classed as satire, it’s incredibly real. Sorry, I forgot to tell you that it’s set in a Sydney advertising agency and has a serious swipe at the industry and it’s “heroes”. I really loved reading this book and am really going to try to read books more often. However, I’m sure you know how it in. Before you know it, the day just disappears. As has the weekend. So, I’d better get this posted quickly. This has been another contribution to the Weekend Coffee Share. This entry was posted in Australia, cooking, Parenting and tagged dinner, family, food, homework, Jeffery Smart, kids, lunch, mom, mum, parenting, pumpkin soup, soup on June 5, 2017 by Rowena. Pumpkin Soup is so 80s, especially when you serve it in its original format with a dollop of sour cream, a sprinkle of chives and a twist or two of freshly ground pepper. While it might be considered a little bit simple, Pumpkin Soup still tastes just as good. For me, Pumpkin Soup has a special place in my heart. My son not only eats pumpkin soup, he loves it! Like a love struck teenager, he can’t get enough of it. That’s great because pumpkin soup is very healthy. For me, however, it is a particular blessing because both of my kids are very poor eaters and usually have to be bribed, cajoled, tied to their seats and even then, they still don’t eat. The fact that their mother and their dog have both put on significant weight is testimony to pig-headed stubborn resistance. After all, somebody human or canine has to actually eat all the “fruits” of all our cooking projects. They even get picky about eating biscuits, cakes…even chocolate. My kids eating habits are just plain weird. That said, I’m pretty sure that the kids have been eating more since the “learn to cook” project began. Well, they have been eating something. That in itself has been an improvement. As I mentioned, our son’s favourite meal has always been Pumpkin Soup and yet I’ve never made it for him myself although we’ve bought it home-made by the local fruit shop. Actually, it was my mother who bought that. You know what grandparents are like when children don’t eat. She almost kidnapped the cook. She would have had this person chained up to my kitchen stove for the term of their natural life cooking pumpkin soup for her number 1 grandson if I hadn’t stepped in and insisted that our family couldn’t survive on pumpkin soup alone. Anyway, Mister and I made our old-time family favourite Pumpkin Soup yesterday. Pumpkin Soup from scratch that had nothing to do with a tin. Nothing to do with a tin at all and I was so proud of us. Not only that. The two of us were working well together, which isn’t always the case. I feel like I’ve been running after this boy most of his life although now that he’s older, he’s become a lot easier to catch. That’s because he’s sitting perfectly still attached to some kind of electronic life form and he’s going nowhere. Pumpkins are low in calories but high in fibre, low in sodium and their seeds are high in protein, iron, and the B vitamins.They are very high in beta-carotene, an antioxidant which converts into Vitamin A, which is important to maintain a healthy body. Researchers also believe that eating a diet rich in beta-carotene may reduce the risk of heart disease and some cancers as well as delaying aging. Even a quick Google search will show you that the humble pumpkin soup has moved on since the 80s and 90s and has actually become rather exotic. There are a number of recipes for Roasted Pumpkin Soup and I might even try one of these. I’ve also had it served up sprinkled with coriander rather than chives. Jamie Oliver has at least 4 variations on this classic. There’s even one recipe where you serve it up with pumpkin seeds. That version seemed a bit interesting. After all, I thought the whole point was to keep the seeds out of the soup. Soon they’ll be adding flies and perhaps even the proverbial mouse to the soup. That would certainly be “a new interpretation of an old classic” but they’d probably want a special mouse for that dish….one which had only even eaten parmesan cheese perhaps…?! Anyway, while so many chefs are intent on reinventing this great classic, I still love the original. My kids are aged 10 and 8 and still need close assistance making the soup. My son aged 10 was able to cut but not peel the pumpkin and this was so much slower than doing it myself. I had to show him how to get the knife through the pumpkin and where to put his hands and apply pressure. It wasn’t an easy task. Our knives are probably not the sharpest but obviously there are concerns about having young children working with knives. You need to work out how to split this task between you and your kids. The hotplate is another safety concern with this dish. Our son successfully fried the pumpkin without getting burned but I was supervising him and reminding him to watch burning his hands on the side of the pan when he turned the pumpkin over. He is able to fry a pancake and is used to using the stove under supervision but he has had couple of minor burns. Mister diced the pumpkin himself under supervision. *This recipe requires a team effort between parent and child. When it came to teaching Mister how to make pumpkin soup, I told him there were 5 main stages to making pumpkin soup: chopping, frying, pureeing, heating, serving. I have always used butternut pumpkin for this soup. I find this easier to cut up than other varieties but feel free to choose your own favourite. It costs a bit more yet buying your pumpkin pre-peeled takes much of the pain out of making pumpkin soup, especially if you have mobility troubles with your hands. You will need to determine whether you should cut up the pumpkin or whether your child is able to do it safely. Mister and I did it together. I sliced off the peel and then he diced the pumpkin himself. Slice the pumpkin into small pieces around 2cm x 2cm. Melt half the butter (45g) in a large, deep heavy frying pan on medium heat. Cook for 10 minutes. They will brown during this time and need to be turned with a spatula. Add water and simmer until the pumpkin is very tender. We were in a hurry so I didn’t turn the hotplate down and that worked well. As the pumpkin softened, I also cut it up a bit with the spatula to speed the cooking time up a little. Lunch was running rather late by the time we’d returned from our trip to the shops to buy the ingredients. Transfer the pumpkin mix to your food processor. Add a little of the milk. Melt remaining butter (45g) in the frying pan and then stir in the flour. You need to move fairly quickly, stirring constantly and making sure it doesn’t form a solid lump which will then make your soup lumpy, in which case, you return the soup to the food processor like us. Quickly add the milk to the flour and butter and then the pureed pumpkin. It might be best to take the mix off the stove while you are doing this to prevent things moving to quickly and getting lumps in the soup. Simmer for 20 minutes on a lower heat setting. Just before serving, mix the egg yolk with a little of the pumpkin soup mix and then stir it into the pumpkin soup. Using a soup ladle, dish up the soup. With four people, each person received two ladles of soup. You could add a dollop of sour cream and sprinkle fresh chives over to each serving or these additions could be placed on the table and diners could serve themselves. I served buttered slices of Turkish bread which were hot straight out of the oven with our soup. Yum! We hope you enjoy your Pumpkin Soup as much as we loved ours. Pumpkin Soup with sour cream and chives. This entry was posted in Kids learn to Cook, Recipes, Uncategorized and tagged cooking, environment, health, kids, mom, mum, nutirition, parenting, pumpkin soup on July 1, 2014 by Rowena.